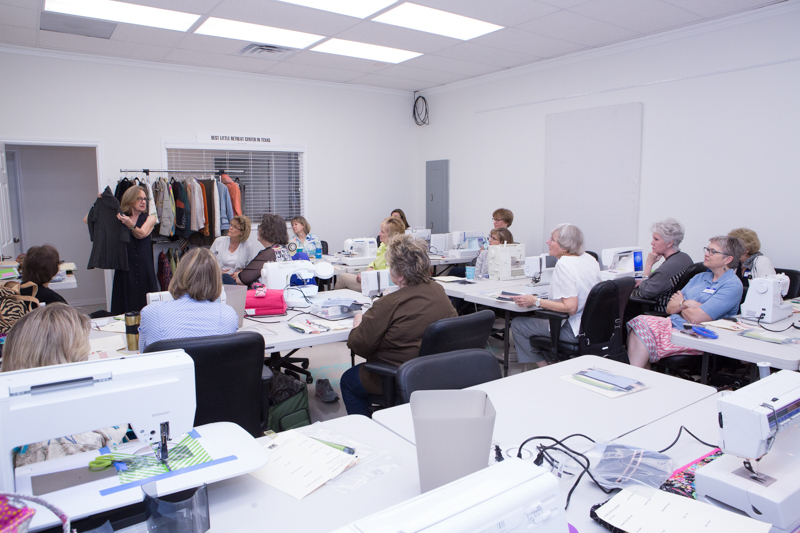 The Plano chapter of the American Sewing Guild hosted Mary Ray (http://www.maryraydesigns.com) on September 29th and 30th, 2017. 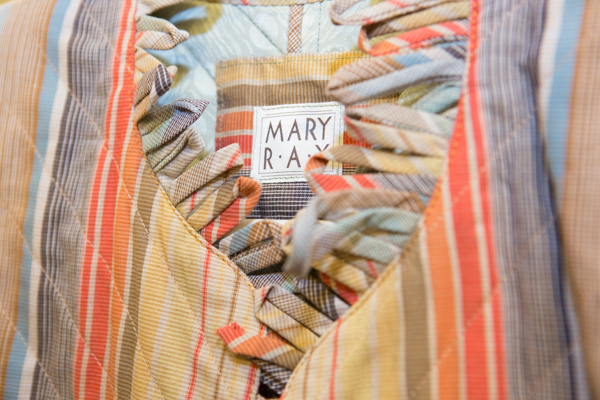 Mary Ray is a contributing editor at Threads Magazine (http://www.threadsmagazine.com/). She is currently teaching Apparel Construction and Flat Pattern Design part-time at Appalachian State University in Boone, North Carolina. Outside of App State, she teaches classes, workshops and retreats. 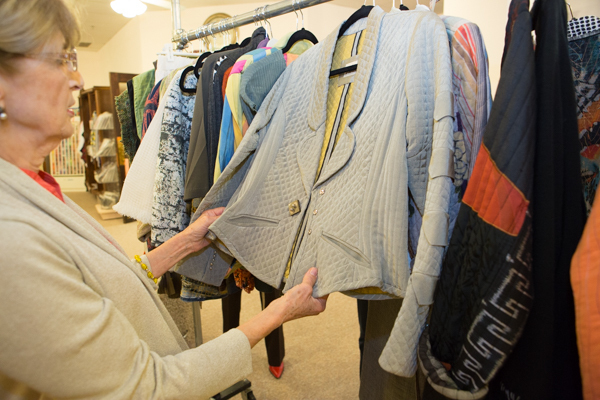 Mary Ray also has a Craftsy class called, “The Fashionably Quilted Jacket” (https://www.craftsy.com/sewing/classes/the-fashionably-quilted-jacket/35753). 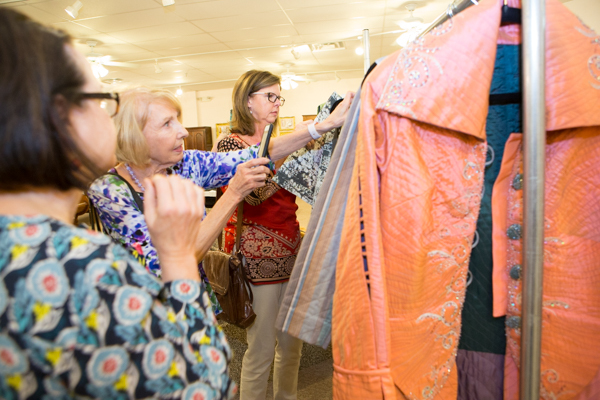 Mary Ray’s designs were showcased at Fabrique Fashion Fabrics (http://www.fabriquefabrics.com) in Plano Friday evening. 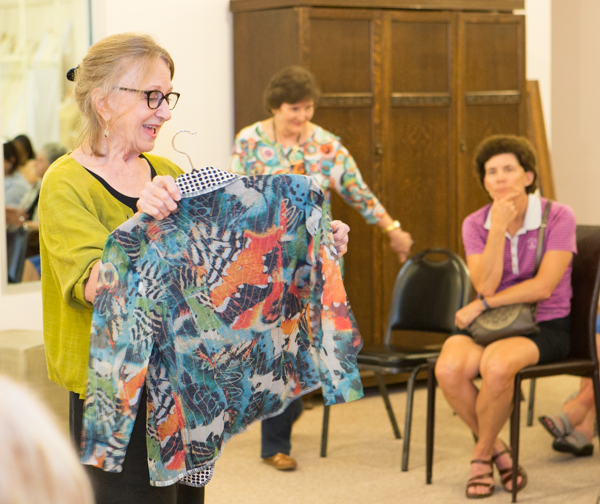 Members shopped beautiful fabric using our ASG discount then listened as Mary Ray discussed the ideas and making of her creative garments and accessories. 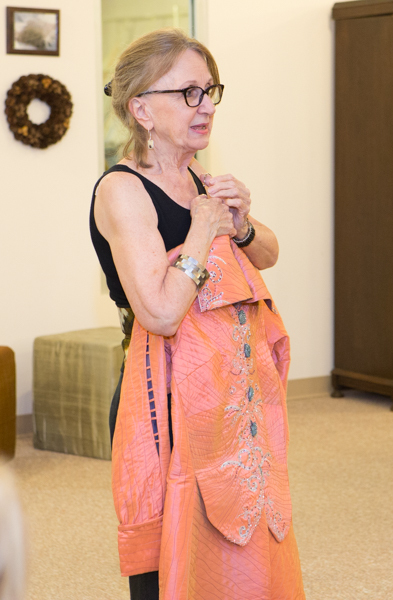 The trunk show began with Mary Ray’s beautiful dress that was featured in Threads magazine. 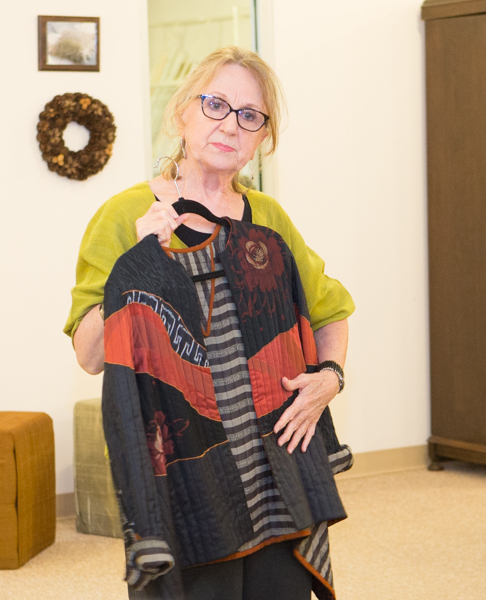 Our president, Sheryl Belson, just happened to make a similar dress from that very article. 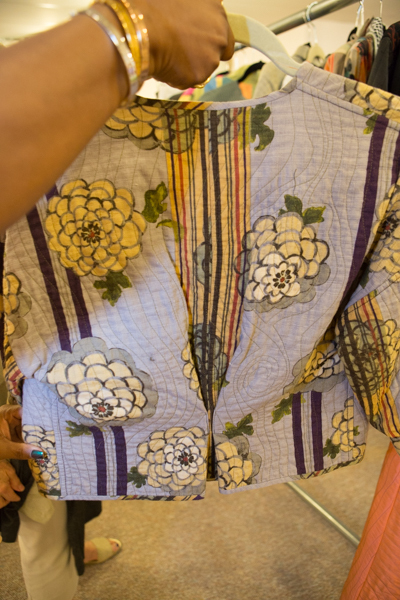 Mary Ray showed jackets she had made using embellishments such as wide pintucks, quilted, sashiko stitched and even one that was a quilted shear. Yes, a shear fabric (i.e. slippery) which she quilted the chest and back, but left the arms shear. What a beautiful feat! That was a fabric challenge from Threads magazine. 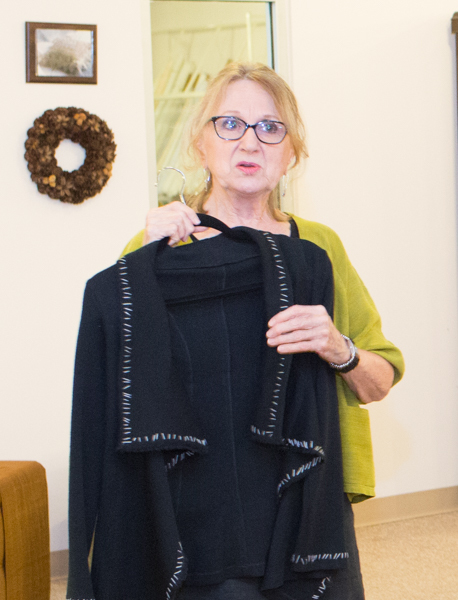 She also talked about problems that she came across (like a jacket back or sleeve that was not fitted) and her creative solutions (tucking or folding). 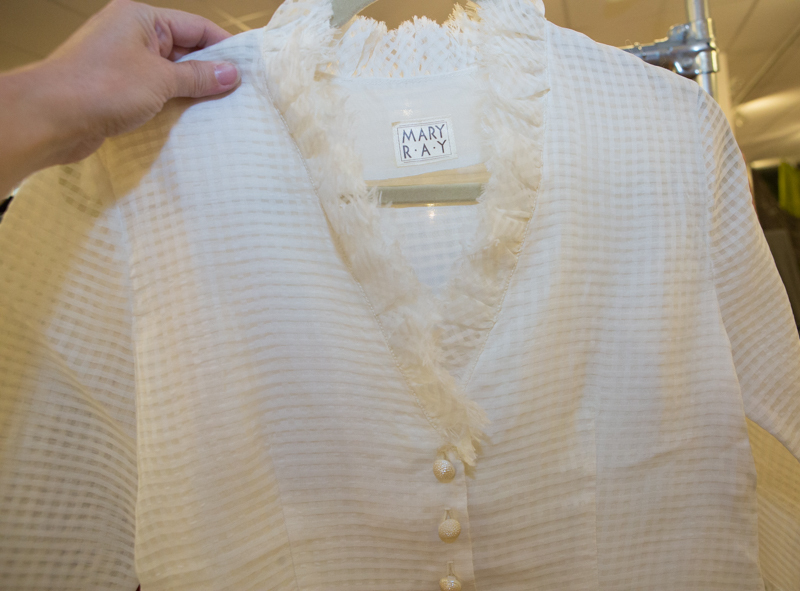 There were blouses with looped collars, fluffy collars and slotted seams. There was the “too long and skinny” scarf that she hand knitted. Knowing the scarf would not be worn because of its ridiculous length, she found a use. 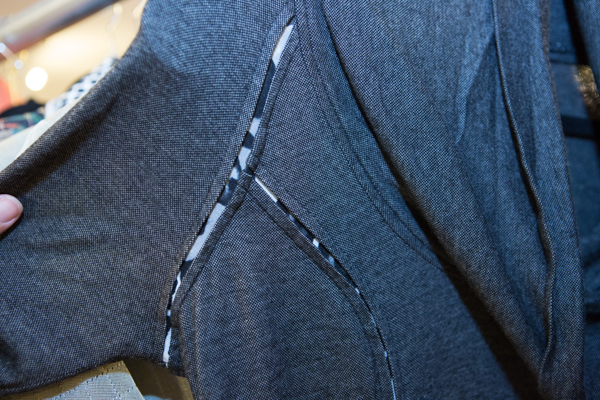 She hand sewed a part of it to the bottom of a sweater. It elevated that nice sweater into something special. 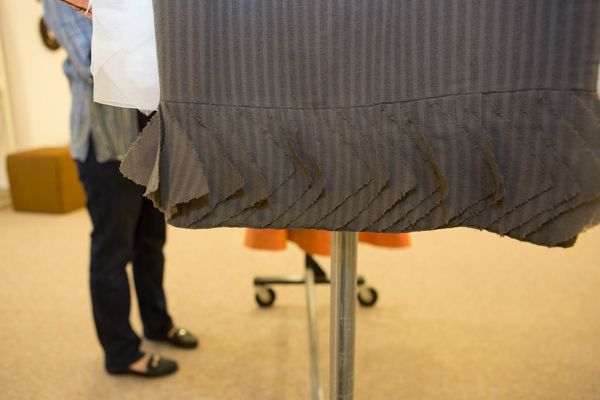 She also showed skirts with wispy triangle details on the bottom and skirts with semi-pleated details. Later that evening she showed the most gorgeous opera jacket. It was made from a discarded prom dress as a part of a zero waste campaign. 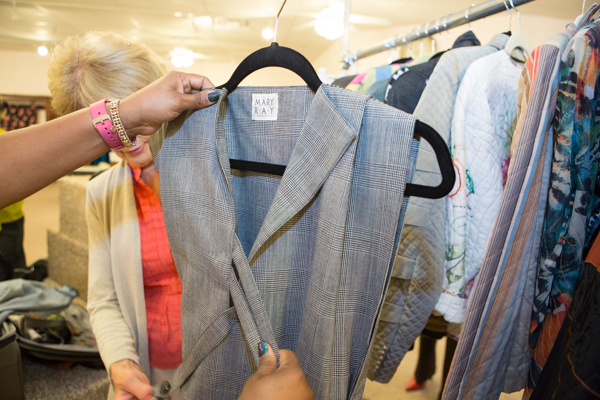 I fell in love with a fabulous gray silk motorcycle style quilted jacket. Oh, if only it was in my size then maybe I’d make an offer to buy it. Would $350 be enough or an insult? Wait a minute. I will be learning her techniques in her “Distinctive Details” workshop on Saturday. I can make my own one day! 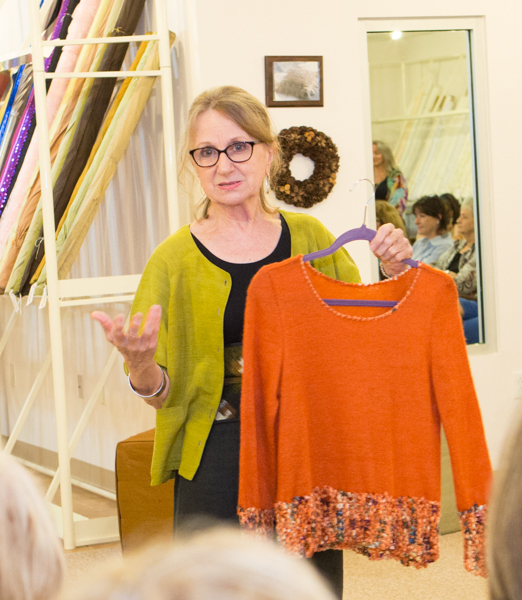 Her “Distinc tive Details” workshop on Saturday did not disappoint. 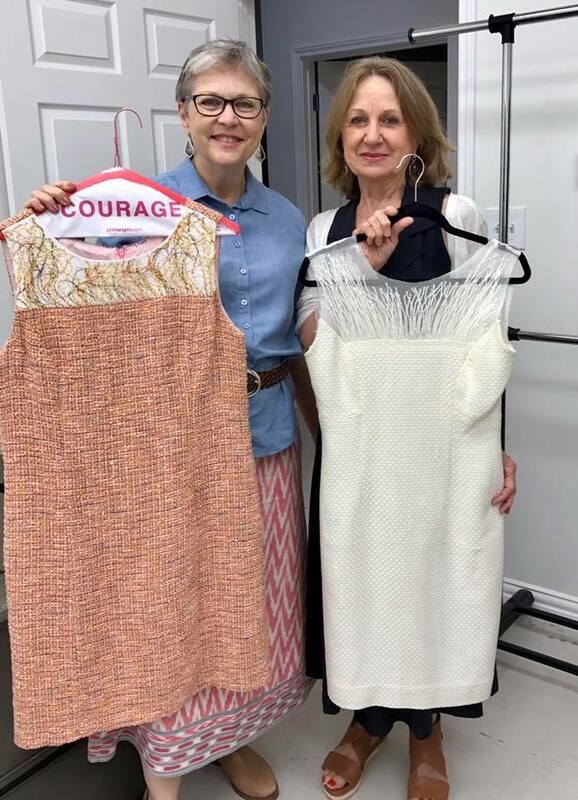 In that one day, she taught us many techniques that included French seams, exposed Hong Kong Seams, slot seams, hemming to the right side, easy miters, narrow and wide pintucks with optional insertions, inserted pleats, loopy trim and appliqued buttonholes. 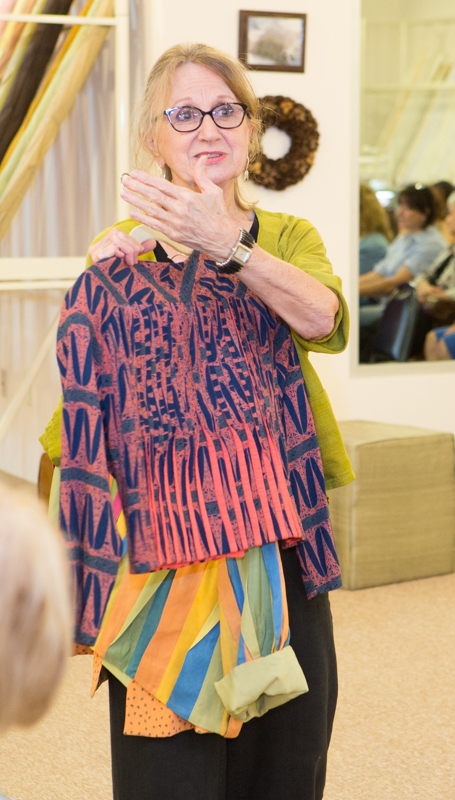 She showed us where she used these techniques in her garments and purses. 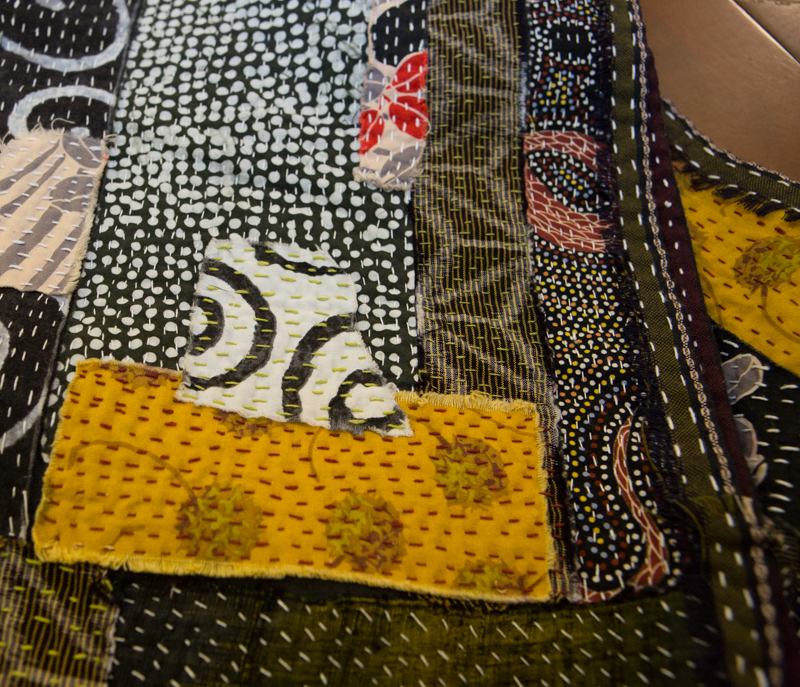 We all came home with a bag of samples we sewed ourselves. 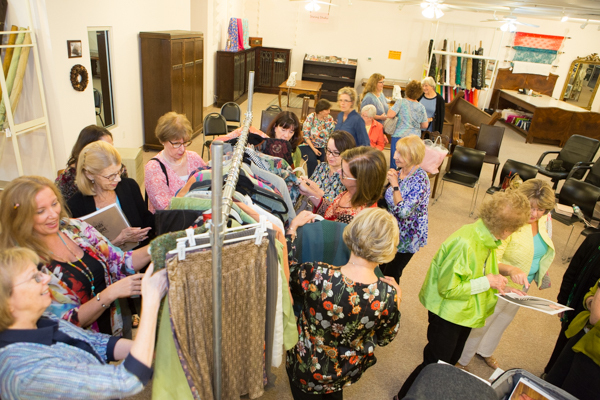 The workshop was held at the Best Little Retreat Center in Texas (http://bestlittleretreatcenterintexas.com/). And it lived up to its name. Chuck helped us lift our heavy machines from our cars and carted them inside. It was modern, clean and well-lighted, with nice tables and surge protected plugs connected by new electric wiring throughout the center. As each technique was learned, creative ideas flowed. I’ve already decided to do slotted seams in the sleeves of a blouse I am working on at home. And one day I hope to make that motorcycle jacket!